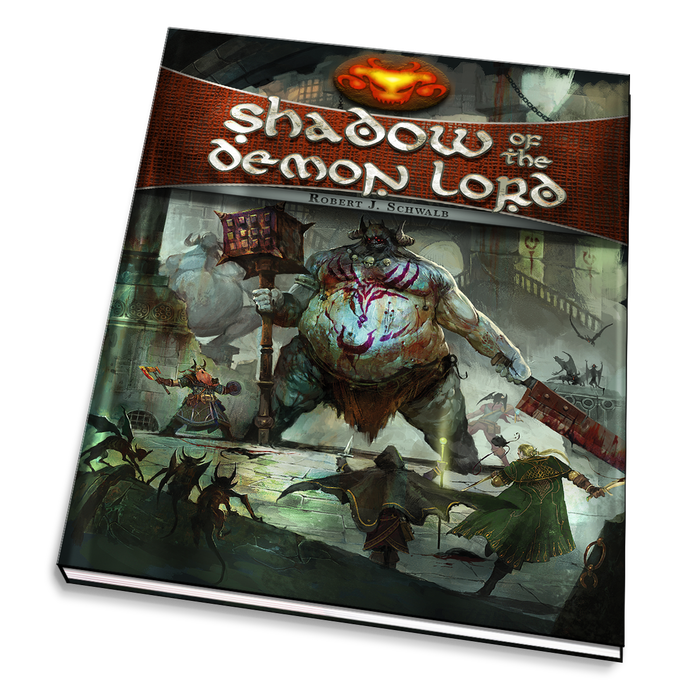 Shadow of the Demon Lord, The Perfect Evil Game.. In my quest to find the "next interesting game" for me, I started with Dungeon World, and I was excited about it. Then I really got into it, and I didn't like it, I didn't like it at all. I was very disappointed as I tried out the system and it fell flat for me and quickly lost my interest in the game, even though it had a huge community behind. In comes, Shadow of the Demon Lord! I was kind of iffy on the whole game, because I had not heard a lot about it and only saw it had a successful crowdfunding that went well over the requested money needed. The game was designed by Robert Schwalb, who has designed various games in the last few years including Dungeons and Dragons 5E. So this game, is designed by a good game designer in the field, has a very evil tone to it, has demons and death on top of that and the system is really simple! Roll a d20, and hit the target number along with adding your boons or subtracting your banes with the roll. They are 6 sided dice you'd roll along with your d20 that would tell you how many points to add or subtract from your rolls. The boons and banes will be assigned to you by the Game Master depending on what you are doing, which can make your life easier or more of a challenge. The interesting thing about the Boons/Banes system is that when you roll them, you pick the highest number of the bunch and use that. So for example if the GM says, "you will roll with 2 boons" and you will roll a 20 sider along with 2d6. You take your d20 roll, and then the highest of the two d6 numbers add it to the d20 roll. Well, that's it for now, I will explain Character Creation next time. The Evil GM - Dungeon World is in my gaming house. Just a random image of it, I don't own these, just the core! 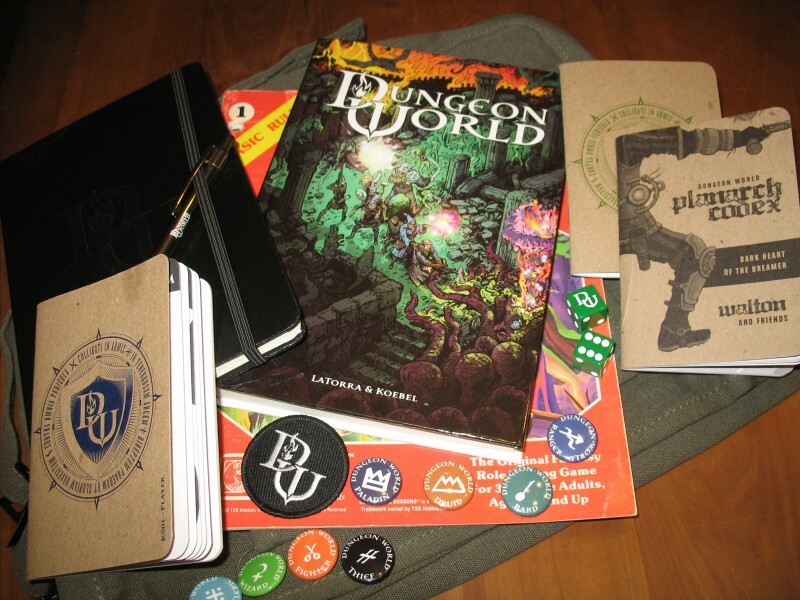 So over the weekend, after talking a few people at my local gaming shop, I picked up Dungeon World. I haven't had a real change to play it or even read it, but after watching the folks play it, the game look really smooth and cool as hell. Sadly the group has no room for me, as they are already 6 players and a GM. While I was sad, I was glad to see a Game Master whom knew his limits for a game, rather then say, "Oh just join us, and we can have fun." He explained as he took down my number that he was very sorry, but he would contact me when someone dropped out and that he cared about the amount of time each player got at the table and how much time he could hold things together to keep it entertaining. I can respect that, a lot. So with a farewell and leaving the gaming store, he gave me a few links to purchase the game pdf and also to start reading up on it. RPGNOW had the book, so that was easy to remember and it was also easy to remember the SRD site, which I thought was awesome, because I can see how the game works with out having to buy it or waste my time reading fluff. Sorry folks, I hate getting into a book, reading all the fluff only to find out, I think the system is not to my liking or its not my cup of tea. Anyhow, here is the website for the SRD in case you want to try out this D&D like game, that's played using only 2 d6's to roll.